You can use different bidding strategies depending on how much time is left in an eBay auction. By paying attention to the clock, you can find out about your competition, beat them out, and end up paying less for your item. Most auctions on eBay run for a week; the auction item page always lists how much time is left. However, sellers can run auctions for as short as one day or as long as ten days. So synchronize your computer clock with eBay’s master time and become the most precise eBay bidder around. 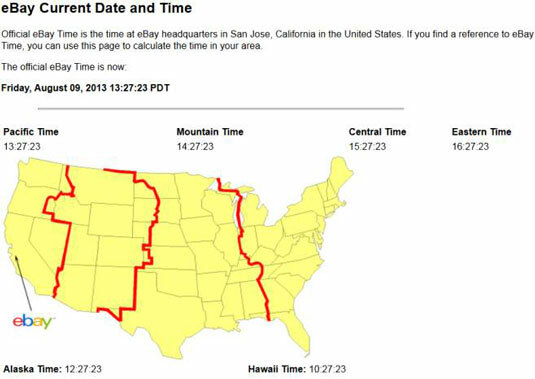 You can find eBay’s Official Time page at the very bottom of many eBay pages. Go into your computer’s Control Panel and double-click the icon that represents your system’s date and time functions. On the eBay home page, scroll down to the Legal & More tab at the bottom of the page and click it. In the Tools and Apps area, click the eBay Official Time link. Check your computer’s time against eBay’s current time. Click the minutes in your computer’s clock and then click the Reload button (sometimes it’s called Refresh) on your browser. Clicking Reload ensures that you see the latest, correct time from eBay. Type the minutes displayed on the eBay Official Time page as soon as the newly reloaded page appears. Repeat Steps 5 and 6 to synchronize your computer’s seconds display with eBay’s. This process takes a little practice, but it can mean the difference between winning and losing an auction. You don’t need to worry about the hour display unless you don’t mind your system clock displaying Pacific time. Most bidding on eBay goes on during East Coast work time and early evening hours, which gives you a leg up if you live out West. Night-owl bidders will find that after 10:00 p.m. Pacific time (about 1:00 a.m. Eastern time), lots of bargains are to be had. And believe it or not, lots of auctions end in the wee hours of the morning. Monday holidays are also great for bargains, as are Thanksgiving and the day after. While everyone is in the living room digesting and arguing about what to watch on TV (or getting up at 5:00 a.m. to buy the big discount deal at Walmart), fire up eBay and be thankful for the great bargains you can win.